Kolkata: Elephant herds are known to migrate across 350-500 sq. km. annually but increasingly fragmented landscapes are driving the giant mammals more frequently into human-dominated areas, giving rise to more man-animal conflicts, experts have found. Maintaining elephant corridors is therefore of crucial importance to both elephant and human habitats. ‘Right of Passage’, an 800-page study released in August 2017, authored by experts and published by the Wildlife Trust of India (WTI) in collaboration with Project Elephant and the U.K.-based NGO Elephant Family, identifies and records details pertaining to 101 elephant corridors across India. Of these 101 corridors, 28 are located in south India, 25 in central India, 23 in northeastern India, 14 in northern West Bengal and 11 in northwestern India. In terms of their functionality or usage by elephants, almost 70% of the 101 corridors are regularly used, 25% are occasionally used, and 6% rarely. Almost all elephant corridors in south India (93%) and northern West Bengal (86%) are regularly used; 66% of corridors are regularly used in northeastern India. The study offers specific conservation solutions for the corridors but points to an inverse relationship between the forest cover available and the number of corridors in each region — the more fragmented the forest cover in a region, the more elephant corridors in it. Thus, the highest number of corridors are located in northern West Bengal, which has one corridor for every 150 sq. km. of available elephant habitat, resulting in heightened human animal conflict and an average of 48-50 human deaths every year. This is followed by northwestern India, which has one corridor for every 500 sq. km. of available elephant habitat. Central India comes next with one corridor for every 840 sq. km. In southern India, there is one corridor for every 1,410 sq. km. of available elephant habitat. Northeastern India fares best with one corridor for every 1,565 sq. km. Among the States, West Bengal has the highest number of corridors (14), followed by Tamil Nadu with 13 and Uttarakhand with 11. In 2005, WTI had mapped and listed 88 elephant corridors. With alterations to natural landscapes and a heightened pace of development, researchers found that seven of these corridors have been impaired and are currently not used by elephants. The team also added 20 new corridors to the list, bringing the total to 101 corridors in the 2017 ‘Right of Passage’ study. The then-and-now comparative findings are worrying. The 2017 report notes that about 74% corridors are of a width of one kilometre or less today, compared with 45.5% in 2005, and only 22% corridors are of a width of one to three kilometres now, compared with 41% in 2005, pointing to how constricted corridors have become in past 12 years. The ground situation studied in 2005 and 2017 also indicates degradation of corridors: 21.8% of corridors are free of human settlements in 2017 compared with 22.8% in 2005, and 45.5% have 1-3 settlements in 2017 compared with 42% in 2005. In terms of land use, only 12.9% of the corridors are totally under forest cover in 2017 compared with 24% in 2005. “About eight corridors have been secured on the ground by State Forest Departments, MoEFCC (Ministry of Environment, Forest and Climate Change), WTI, and other conservation organisations. This process needs to be hastened and other high priority as well as threatened corridors need to be secured on an urgent basis,” says co-author Dr. Sandeep Kr Tiwari, Programme Manager, IUCN Asian Elephant Specialist Group (AsESG). To increase awareness on elephant corridors, the team is planning ‘Gaj Yatras’ — parading life-size elephant models crafted by local artisans on road shows through corridors across 12 States where elephants range. 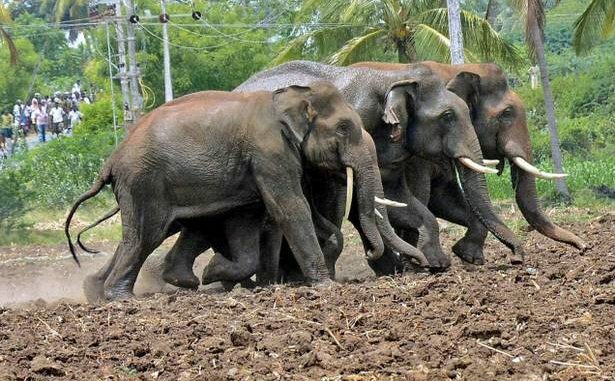 Moreover, two in every three elephant corridors in the country are now affected by agricultural activities, the study points out, adding that 58.4% corridors fall under settled cultivation and 10.9% under jhum (slash and burn) cultivation. “All the corridors in northern West Bengal (100%) and almost all in central India (96%) and northeastern India (52.2% under settled cultivation and 43.4% under slash and burn cultivation) have agriculture land. About 72.7% of the corridors in northwestern India and 32% corridors in southern India have agriculture land,” the study states. Taking note of 266 instances of elephants deaths caused by being run over by trains between 1987 and July 2017, the report points out that 20 corridors have a railway line passing through them. In all, about 36.4% of the elephant corridors in northwestern India, 32% in central India, 35.7% in northern West Bengal and 13% of the elephant corridors in northeastern India have a railway line passing through them. Moreover, almost two-thirds of the corridors have a National or State Highway passing through them, fragmenting habitats and hindering elephant movement further. The study notes that almost 20% of the corridors urgently require an overpass for vehicles to facilitate the unhindered movement of elephants. In addition to railway tracks and highways, 11% of corridors have canals passing through them, and 12% are affected by mining and the extraction of boulders. Three months ago, the Supreme Court, in response to a Public Interest Litigation (PIL) petition submitted by Wildlife Conservation Society-India (WCS) scientist Vidya Athreya suggested that nine States acquire land across 27 high-priority corridors to enable safe movement of elephants. “Identifying corridors is a dynamic process; many States have started notifying corridors,” says R.K. Srivastava, Director of Project Elephant. The States’ responses are expected this month.